Halyomorpha halys (Stål), the "Brown Marmorated Stink Bug," was accidentally introduced into Allentown, PA around 1996 from China or Japan. The Brown Marmorated Stink Bug feeds on a wide range of fruits, vegetables, and other host plants beginning in late May/early June including peaches, apples, green beans, soybeans, cherry, raspberries, and pears. Damage to host plants from the Brown Marmorated Stink Bug is typically small necrotic areas but ranges from leaf stippling, catfacing on tree fruits, seed loss, and transmission of plant pathogens. 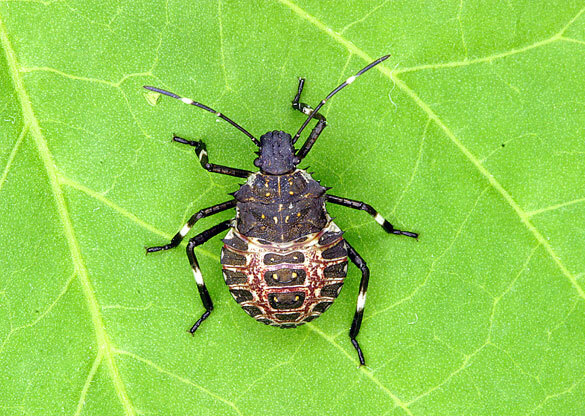 During the summer the stink bug produces offspring that survive the winter as adults by entering houses. They enter houses through cracks in windows and the foundation and may be seen in large numbers during September and October. Due to the noxious odor produced as a defense mechanism, the stink bug causes a nuisance to homeowners. Since its introduction into Pennsylvania, it has established itself as a potential risk to agriculture as well as a nuisance to homeowners and has been steadily spreading throughout the eastern United States. For more information please see the Rutgers New Jersey Agricultural Experiment Station (NJAES) Cooperative Extension fact sheet FS002.